We recommend you five video presentations on Nature-Based Solutions which had been realized during the “Nature-Based Solutions: Pandora box or reconciling concept?” free webinar organized by our partners EKLIPSE & BiodivERsA on 4 October 2017. This was a follow-up of the Joint Foresight Workshop « Social Innovation and Nature-Based Solutions » that was held in Brussels in December 2016(see here). NBS has a high potential to address environmental and social challenges but is not very well known as a concept even though many organisations may already be working on similar approaches but under different names. 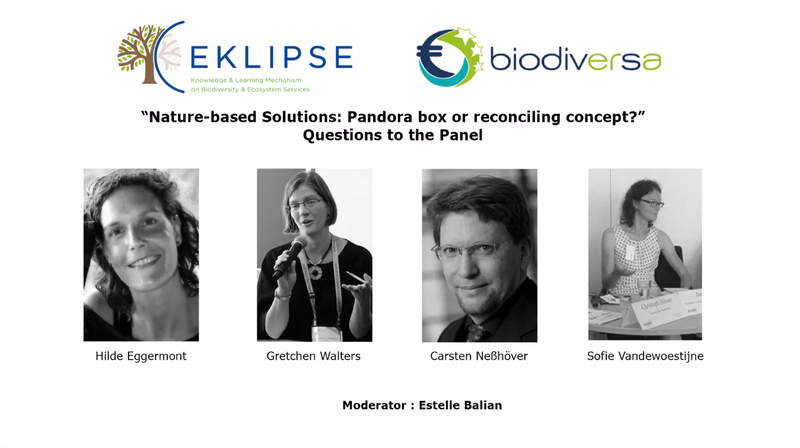 As a consequence, EKLIPSE & BiodivERsA supported the debate with this webinar. During the webinar, the organisers (1) brought some background on the plurality of views and the existing typology, (2) illustrated that with examples, (3) explained a few key principles for effective implementation, and (4) identified limitations and remaining questions. The main objective is to stimulate exchange on NBS and to further raise awareness on the results of the Workshop on Social innovation and Nature-Based Solutions in particular on the debate on NBS typology, benefits, and limitations. The organisers invite all researchers, policy-makers, practitioners and businesses interested in knowing more about NBS to join us in this discussion via this one and a half hour webinar. Overall, they stimulated exchange on NBS and further raised awareness of the challenges and opportunities of NBS.